LaCrosse and Danner…the boots of hunting camps everywhere. Warm weather hunts in dry conditions will typically find these guys in the Danner High Ground boot. “I am pretty much exclusively in the uninsulated Danner High Ground boots for spring turkey hunts and early season western hunts,” says Scotton. “These things are very comfortable and lightweight. They fit more like an athletic shoe than a boot. 100% waterproof and breathable GORE-TEX, 400 grams of Thinsulate Insulation, EVA midsole provides added cushioning, Lock and load lacing system, Danner Talon outsole provides extremely lightweight athletic performance, Nylon shank, 8″ height, 50 ounces. Shawn Hansen, Director of Sales for LaCrosse, shot this nice buck at River Valley Farms in Kentucky. His favorite early season boot is the uninsulated Alphaburly Pro. 18” Height, 4.8 lbs per pair, Uninsulated, Realtree Xtra Green, Removable EVA Footbed, Fiberglass Shank. Another great option for warm weather hunts is the new LaCrosse 4XAlpha. This boot has quite possibly one of the comfiest footbeds ever designed. 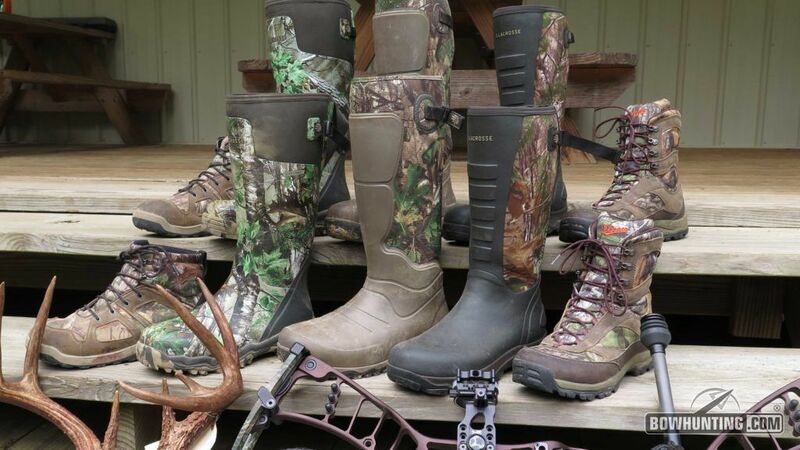 It’s perfect for warm weather hunts where you’ll encounter water, but don’t want to be bogged down with a big, heavy, rubber boot. Once on stand, the boot can easily fold down for cooling comfort. Jeremy Scotton of LaCrosse with outfitter, Harry Pozniak, of River Valley Farms, taking up an early season blood trail. 16” Height, 4.8 lbs per pair, 3.5mm Neoprene Insulation, Removable Polyurethane Footbed, Nylon Shank. Turn down for what? Release the heat when wearing knee boots by turning down the super-cozy 4XAlpha’s. The LaCrosse Aerohead is a great all-around boot to carry you through a variety of seasons and weather conditions. hunting. “I have been wearing it all fall here in Kansas with temps ranging from the upper 60’s to lows in the 20’s,” says Scotton. The boot is warm, durable, and virtually maintenance free with injected polyurethane instead of rubber construction. The boot is super-comfortable, featuring an athletic fit that lets you walk for miles, if you need to. 18” Height, 4 lbs per pair, 3.5mm Neoprene insulation, Removable EVA Footbed, Bi Fit Board Shank. River Valley Farms outfitter, Harry Pozniak, says that he’s a big fan of the Danner Steadfast boot for every season. “I wear the Steadfast all year long,” says Pozniak. “They are a light boot with great traction. When things start to cool off and my feet get cold, I wear boot blankets over the top of them. I hate wearing big, heavy, blocky boots, so the Steadfast are the perfect option for me. With all the use and abuse I put boots through as an outfitter, I usually go through two pair of boots a year. But the Steadfast has held up well and continues to perform. Danner Comfort System (DCS) delivers best-in-class durability, support and comfort, Durable nubuck leather and 900 Denier nylon upper, Waterproof Danner Dry liner, Anatomical design and broader toe box for responsive fit, Patent-pending plush dual-density footbed for cushioning, underfoot venting for maximum airflow and Airthotic heel clip for support, Danner Steadfast outsole for solid traction over rugged terrain, Thermoplastic polyurethane shank, 8” height, 52 ounces, 400G insulation. Don’t let cold feet take you out of the game. Stay warm with the LaCrosse Alphaburly Pro 1600.
days will send you back to the truck in a hurry. The good news is, there is a solution to this age-old problem. The LaCrosse Alphaburly Pro with 1600 grams of Thinsulate is the boot of choice for late season hunting. It provides a great fit without being too bulky like your typical pac boots. “Whether you’re sitting in the deer blind in January, or on a frozen lake ice fishing, these boots will keep you warm, dry, and comfortable,” says Scotton. 18” inch height, 5.5 lbs per pair, 1600G Thinsulate, EVA Footbed, Fiberglass Shank. One tip the guys offer to help boost the insulating properties of your boots in the late season is to swap out the EVA foam insole that comes with the boots for a pair of 6mm wool/felt insoles. This seems to make a big difference in blocking the cold that radiates up from the ground, ice, or metal tree stand. If you still haven’t filled your tags by the time the extreme cold temperatures hit, try the LaCrosse Ice King pac boot. The Ice King continues to be the go-to boot for extreme weather hunts and ice fishing fanatics. 10” height, 6.6 lbs per pair, 400G Thinsulate Ultra Insulation, Steel Shank. When you switch from bucks to ducks, LaCrosse will still have you covered. several great options from LaCrosse. The Alpha Swampfox Drop Top is a great choice for early season hunts. It is a waterproof, breathable wader that you can wear as a regular chest wader or as a pant wader. Other features include a waist belt and side adjusters on the leg for a great fit. The boot is an Alpha constructed boot featuring 3.5 mm of neoprene plus 600g of Thinsulate for comfort and warmth. For later season wading, switch to the SwampTuff Pro with 5mm neoprene fleece lined with armor welded seams. This wader also features the Alpha constructed boot with 3.5 mm of neoprene plus 1000g of Thinsulate. The combination of the neoprene plus the Thinsulate gives the boot a thermal rating close to a 1400g Thinsulate equivalent. The Swamp Tuff Pro is a super comfortable, great fitting wader. No matter what critter you pursue or what the weather throws your way, LaCrosse and Danner boots will keep you in the hunt. Be sure to check out the LaCrosse and Danner websites for more on the exciting lineup of boots and waders for every season from these two great companies. For more information on deer and turkey hunting in Kentucky, check out www.rivervalleyfarmsky.com.